When NIZO, an organisation that specialises in research and food, was looking for an original way to launch their new company website, Noterik and QANDR were able to deliver just that. 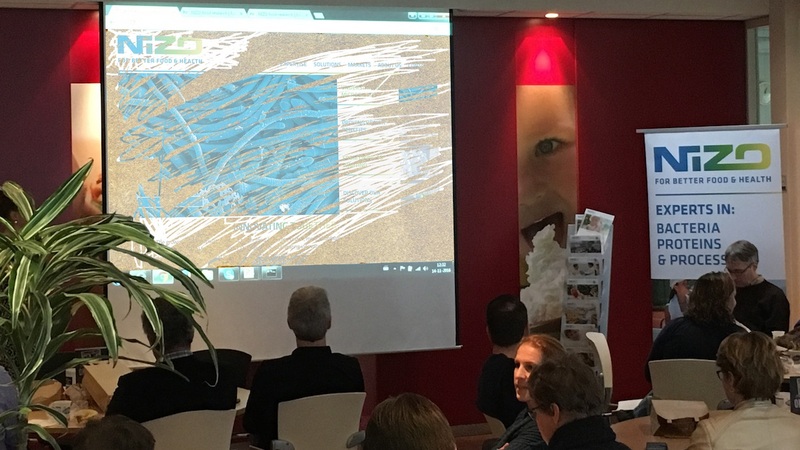 In a brainstorm with the bright minds of Jasper van Bochove of Caramel Business and Roderik Berghegen of Pitvis, the idea emerged to reveal the new site to NIZO employees by letting them use their phones as erasers to gradually uncover the new website viewed on a large screen. Jasper and Roderik contacted Noterik with the question whether it would be possible to build a custom-made QANDR module that would allow for this type of interaction. We liked the idea and started to work on it, first making a simple wireframe and then testing and optimising the functionality. In the beginning the reveal worked like a proper eraser but real-life testing showed that people have the tendency to really scratch their phone, and move their finger rapidly across the screen. This feedback lead us to update the drawing mechanism and design an algorithm that emulates lines between not-connected points on the phone. Although the revealing process went rather quickly – with around 60 people it was completed in maybe 4 to 6 seconds – the overall experience was good. The entire group of employees was involved in uncovering the new website and people found it interesting and funny to be able to use their own phone to ‘clean up’ a main screen. Apart from the user experience it was good to see that, because we at Noterik build the software ourselves with our Multiscreen Toolkit, we can work with QANDR as flexible building environment. This gives a lot of potential for working with partners that can specify phone-main screen interactions that match a social processes of a specific meeting or event.